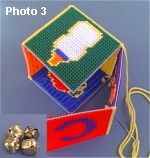 This is a great plastic canvas craft project to make for your baby or toddler. 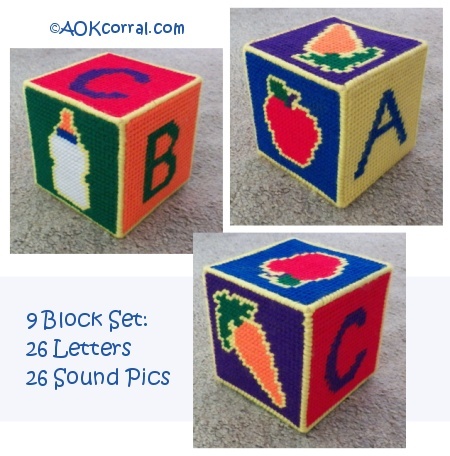 Baby blocks teach letters, sounds and colors while being fun to play with. 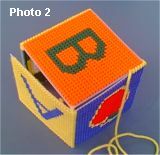 This copy contains patterns for the entire alphabet and letter sound pictures on baby blocks, 9 total blocks. The Easy Print Version includes patterns for all the letters of the alphabet and matching letter sound pictures, a total of 9 baby blocks. This version comes without margins, ads or logos. Yarn - Bright primary colors of Red, orange, yellow, green, blue, purple, and pink. Also needed; white, lt. gray, lt. brown, and black. Patterns for the rest of the alphabet, 8 more blocks, available on the easy print/pdf version. PDF is available for download immediately after payment. If you do not have pre-cut squares of plastic canvas, take a few minutes to cut your canvas into squares as indicated in the materials list above. Begin by using the patterns given for A,B & C to create all six block sides for the ABC block. Pick a color of yarn to use, thread the needle and tie a knot in the end of the yarn. Line up the holes of each block piece. Start at one corner hole and bring your need all the way through from the wrong side. Next go through the adjacent hole in the other piece from the right side through to the wrong side. Finish your end of yarn by feeding it through a few stitches on the wrong side. Set two of the joined pairs together along their L shaped sides. Join them together in the same "looping through pairs of holes" manner as above. Join them together in the same manner as above but before closing up the last side, drop 4 Christmas type jingle bells into the block. Finish closing up the last open side. To secure the end of your yarn on the last side, feed the needle and yarn up through 4 or 5 loops along one of the corners and then through a few more. A Fun Baby Toy for your baby or as a Baby Shower Gift.